Flea Services – Grand Rapids Pest Control, Inc.
Fleas are dark, wingless (and thus flightless) insects that affect both animals and humans. 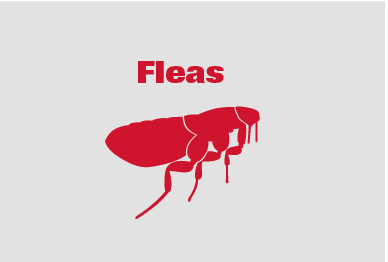 Fleas feed on a host’s blood and may live either on or off a host. Fleas do not need a host to live and are often found on the ground outside of a home. Once fleas “bite” a victim (for humans, typically around the ankles or lower legs), the site may become very itchy and red, and scratching of the bite area may cause a secondary infection. Some people react very strongly to flea bites and are termed “allergic” to fleas. GRPC’s service has a 90-day guarantee from date of service. Products listed below. • Before treatment: all items must be picked up off floors. Floors must be vacuumed, and vacuums should contain fresh bags when our service technician(s) arrives (we treat the vacuum as part of our service). • After treatment: carpeted floors should be vacuumed daily for 2 weeks to ensure complete elimination of pests. *Pets should be treated by a veterinarian.